Sixteen-year-old Janelle (not her real name) is in court on a charge of attempted shoplifting. Demure, she looks from her table opposite the jury box over to her father, who’s sitting in the gallery. She’s in a Red Hook courtroom like many others in New York. But in this court, Janelle’s lawyer, the prosecution, the judge and the jury are all like her — teenagers. In addition to youth court, alternative programs exist beyond the sentencing phase. Teens who have been detained or sentenced can be assigned to an alternative-to-detention program. The hearing in Red Hook simulates a real trial, but instead of a prosecution and defense, there’s an advocate for the defendant and a community advocate. Instead of a sentence, the court hands out sanctions: community service, a letter of apology or enrollment in a counseling program. 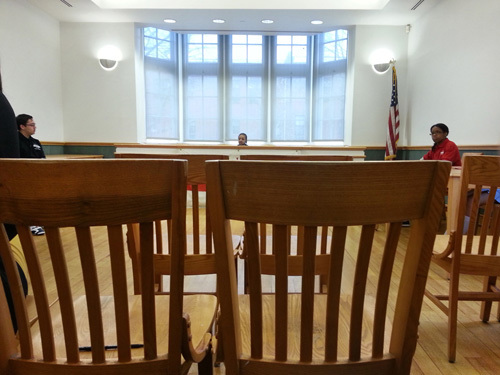 At this trial, Rosalina, 15, serves as the community advocate. She will explain how Janelle’s crime negatively affects the community. Despite its high success rate, there’s one crucial barrier preventing the creation of more youth courts in the city: money. “If we had enough funding, every neighborhood would have a youth court,” said Taylor. For most passing by, the eight-story faded brown building off of Chapel Street in downtown Brooklyn is one of thousands of others. But for court-involved teens, the building provides a refuge from detention center sentences. It is home to The Center for Community Alternatives (CCA), an alternative to detention program for court-involved youth. Courts can mandate that, instead of being held in a detention center, a juvenile be sent here, or to one of the other alternative to detention programs in New York City. Program graduates believe those who go through these programs are more successful at staying out of trouble than those who go to detention centers.